Last week I Wordless Wednesday featured Captain Cook, a famous resident of Whitby in Yorkshire. 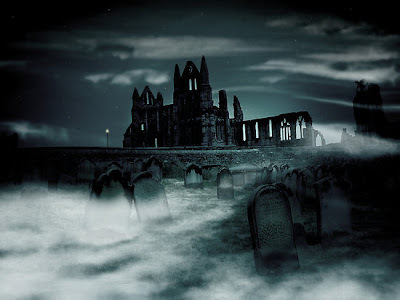 Whitby was also the setting for some of the chapters of Irish novelist Bram Stoker's notorious novel, Dracula. The skyline above Whitby is dominated by the ruins of St. Hilda's Abbey, built in 657 A.D, which looked particularly haunting and menacing on the stormy day we visited. Not surprisingly, Goths love the place and hold a festival at Whitby every year!